My Rosketti is cracking. What did I do wrong? Small cracks are normal (see my photos of the baked cookies), but if they are cracking all the way through, you may need to do a couple of things. First, take the cookies off the pan IMMEDIATELY after they come out of the oven and place on a wire rack to cool; DO NOT let them sit on the hot baking sheet. Secondly, if it’s a pretty dry climate where you are, you may need to add a tiny bit more liquid to the dough—add up to 3 tablespoons regular milk with the rest of the wet ingredients and mix well. Give that a try and let me know how it turns out. Trying this for my first time in San Diego. I’ll let you know how it taste.. Thank you for your website, it helped me make the red rice for my mom’s rosary. Made the rosketti and it was delicious. Just now have to figure out why it was hard to do any sort of decorations, even just using the fork was a slight issue. Can this recipe be made the night before, then baked the next day? I’m sure it will be fine to do so. Is it ok to use margarine instead of butter? Will it make a difference on taste? Texture? 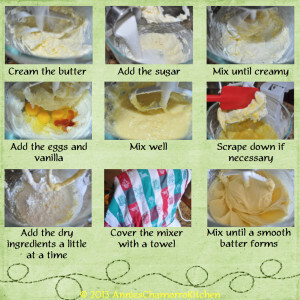 I only use butter in my recipes that call for it, especially in baking. Butter is made from cream and adds more flavor, whereas margarine is made from oil. Margarine also has more water in it, so if you decide to use it, your cookies will be flatter and will spread during baking. Can we use brown sugar? You can, but it will alter the flavor slightly. Question: if you do not have a blender, can you microwave the butter so you can mix it in with the recipe? Some microwaves have a setting to soften butter. You could also just leave the butter out and let it soften at room temperature. Do I need to use the whole container or just add until I get the desired texture? The whole container, as stated in my recipe. I wanted to triple your Rosketti recipe. Do i just triple all the ingredients? Yes, triple all the ingredients to triple my recipe. You’re welcome! Happy holidays to you and yours! Hi will the texture still be the same if I add a little food coloring? Would you recomend large eggs or extra large eggs? Patti, it really isn’t the brand of butter you use, but the quantity. 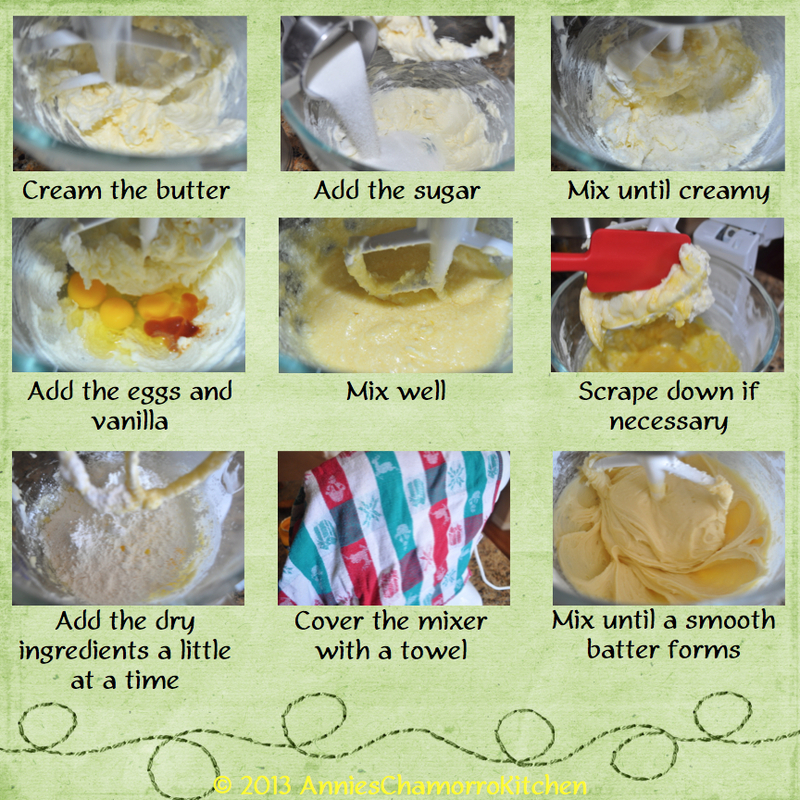 A stick of butter equals 1/2 cup, so you will need a total of 1 cup of butter for my recipe. Annie, do you use the ‘salted’ or the ‘unsalted’ butter sticks? Attempted to make it , but How do we make it not crumby ?! This cookie will be crumbly because it is a cornstarch-based cookie. You also need to take them off the baking sheet immediately after coming out of the oven or they will stick to the pan and crumble when you try to take them off. I’m going to make these for the Guam Liberation Day Celebration in Tucson next Saturday! They turned out GREAT! I made 2 batches; the first with vanilla extract and the second with lemon extract. 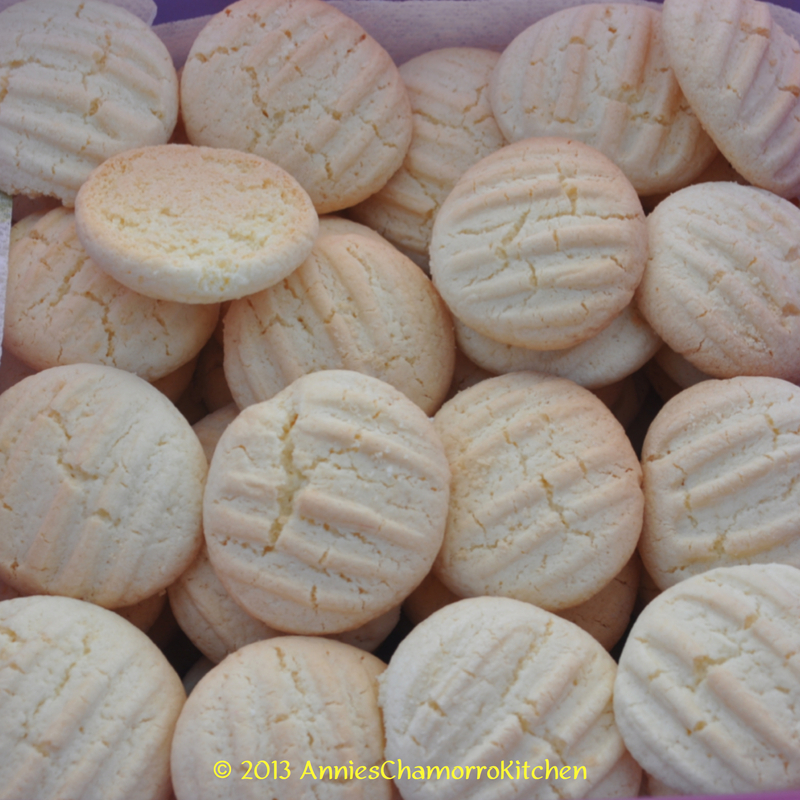 Both batches turned out great, but the lemon extract ones were tastier. 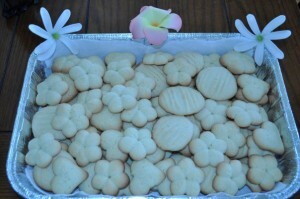 I used a Guam Seal cookie stamp that my dad gave me for Christmas (from the Gerard Aflague Collection). The cookies were a hit at the Liberation Day Celebration! Hi Annie. I attempted to make this the other day and I must say, it is exactly the ones I’ve been looking for. Its an incredible melt in your mouth rosketti. This is the first time I have ever made this and I kind of had a difficult time rolling them into balls. It was so sticky, it kept sticking to my hand. So I sprayed Pam on my hand and it worked okay. The cookies still came out delicious. But I was wondering if I did something wrong. It’s supposed to be a little bit sticky. Try refrigerating the dough for a few minutes. Spraying Pam on your hands is good; you can also dust your hands with some corn starch or flour. Thanks for the tip but I think I know what I did wrong. On the first attempt I accidentally poured all the dry ingredients all at once. I didn’t fully read your procedure. So I made it again today but this time I poured little at a time. When it was time to roll them into balls they were perfect. They werent as sticky as it was the first time where I couldn’t even roll them at all cause it literally stuck to my hand. Thank you again for your wonderful recipe. My family can’t get enough of it. Hi Annie, I made these today and I must say they are incredible. Nothing like melt-in-your-mouth kind of treats, even my 3 year old wouldn’t stop eating them. Question though, can I add a little more vanilla extract or will it change the taste? I love vanilla extract but not at the expense of these oh so tasty delicacy! You can add more vanilla extract if you’d like. Annie for the butter how many cups do I use? I know the 1 stick of butter=1/2 cup. Thanks Annie for the clarification on the butter. I’ll make it and let you know how it turns out. It was my first attempt to making this dessert & it was gone before I knew it. My family loved it. I just want to know if I can add some food coloring, if so how many drops is safe to add? Is it possible to replace the vanilla extract with any other flavored extract, if so how much is safe to add? I’m glad you liked it! Yes, you can add food coloring…add a few drops (a little goes a long way). You can also use other flavored extracts; use the same amount as you would vanilla extract. Hi Annie, do you need to add milk or water to the mix? No, I don’t add milk or water in my recipe. How long do I cover the dough with the towel? You only cover the mixer with a towel to prevent the dust from the cornstarch and flour from spewing out all over the place. Cover it long enough to incorporate the dry ingredients with the wet. Once the dough comes together, remove the towel. Great recipe! Easy to make and everyone loved it. Thank you for sharing! 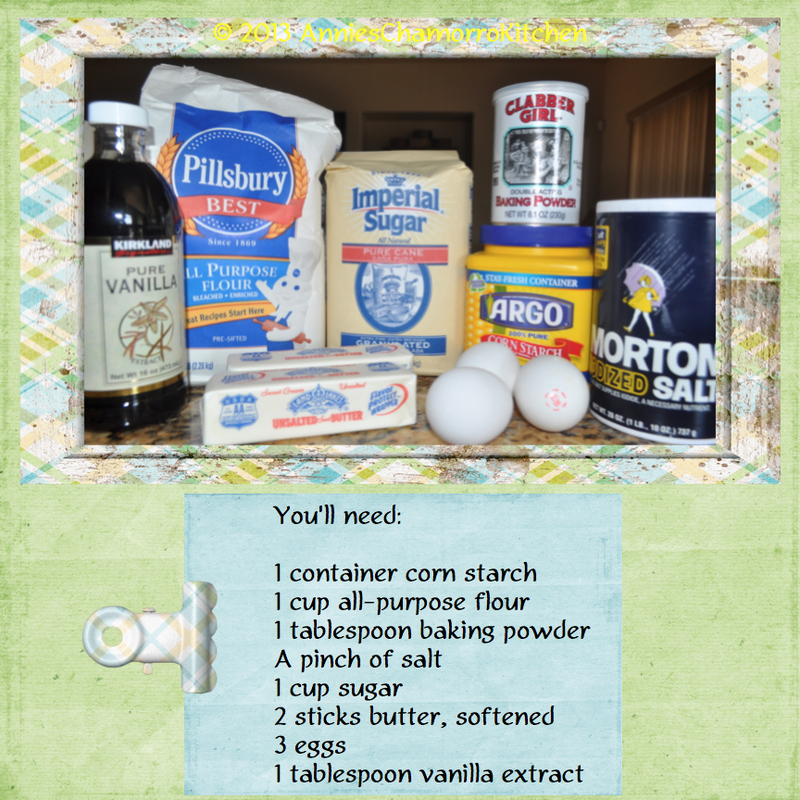 How many cookies does your recipe make??? About 5 dozen, depending on the size. Some rosketti have a different flavor. Do you know what this is? I suspected it was anise flavoring. I like those but can’t find anyone who makes them. You can add different flavored extracts to the dough. I’ve never tried anise flavored Rossetti, but I have tried ones with lemon extract. How much lemon extract can use as a substitute for vanilla and almond? Use the same amount of lemon extract that I call for with Vanilla or almond extract. Do a 1-for-1 substitution. 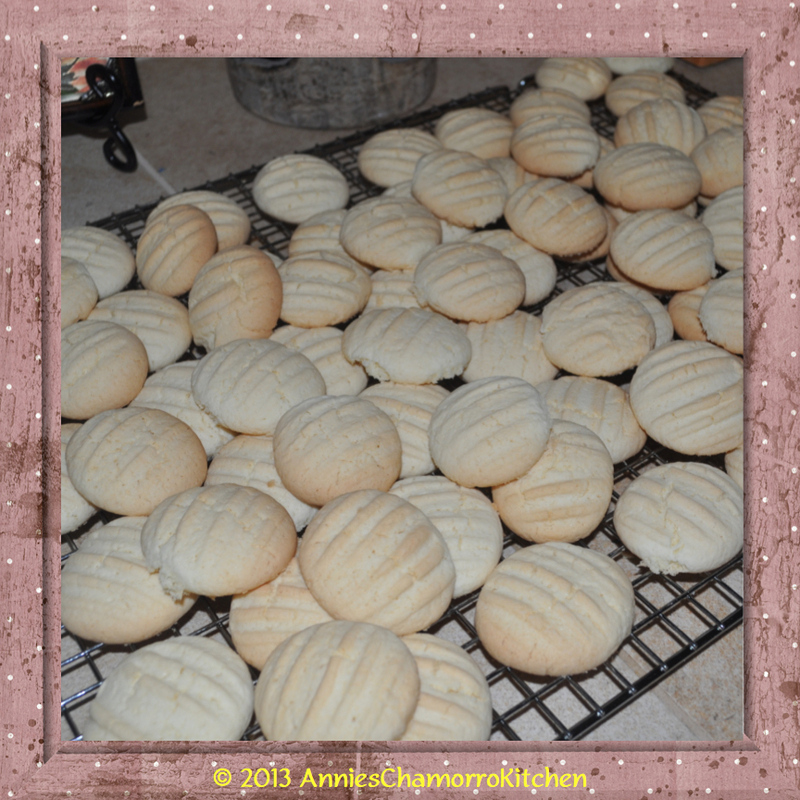 My family loves making it with anise and sprinkle colored sprinkles on top for the holidays. Annie, I once tried it where someone made rosketti using wheat flour and baked them a little longer. Have you tried this? If so, how much flour would you recommend we use. I enjoyed that flavor a lot. I’ve never made this with wheat flour so I can’t make any recommendations on how much to use. I agree, Alan, I think it’s anise. It is anise seeds, it is the only way I make Rosketi. I’ve never used the liquid form, just the seeds. I enjoy eating this yummy cookies. Hi Annie, of all the recipe out there for Rosketti, yours is the only one I use! Love love love those Rosketti! My favorite Chamorro cookie – I still make them in pretzel shapes! Love love love these cookies!! You’re welcome, Gloria N Jerome. Let me know how it turns out. 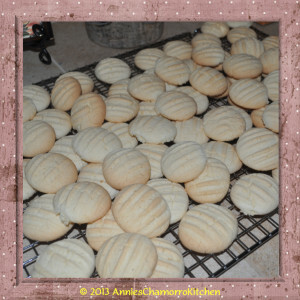 thanks for sharing would like to try your recipe! Hi Serf! You’re welcome…and thanks for stopping by! What temperature will they be bakeked and how long? Marcy, the temperature and cook time are found in the third photo. Hi Annie, I wanted to make these and color them, would adding for coloring be OK? Hi Vicki. Yes, adding food coloring to the dough would be okay. 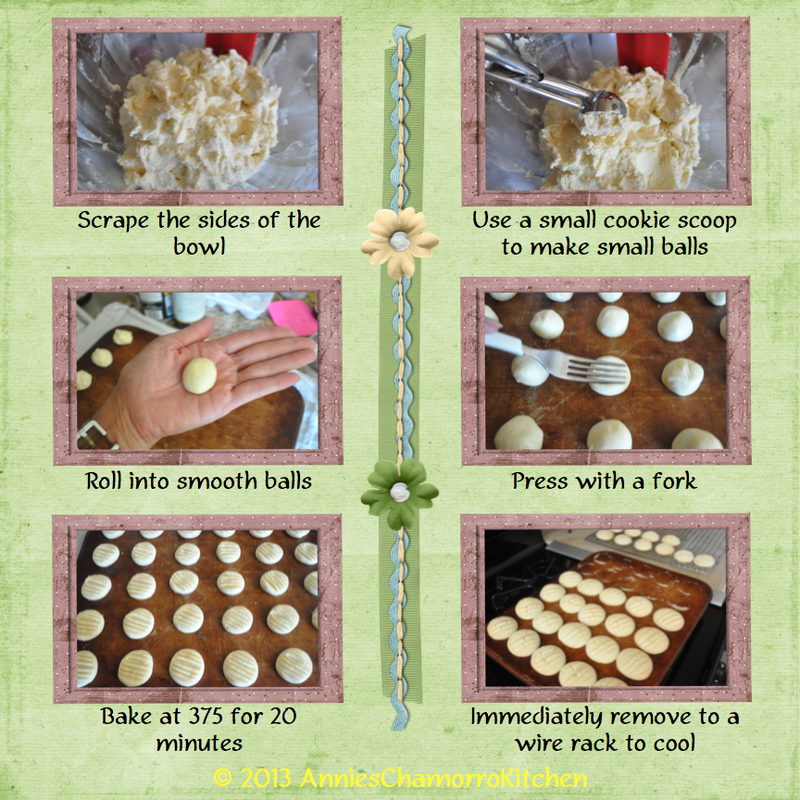 Hi Annie, I’vw made some and had to repeat it the very next day. So, here is a huge THANK-YOU from my home. Hi Barbara! I’m glad they were a hit! Thanks for stopping by! I want to make these for visiting relatives. Can they be made ahead and frozen? Or how far in advance can I make them & still have them taste fresh? Hi Elizabeth. I’ve never frozen these before but I imagine freezing the dough would be fine. Shape the dough into a couple of flat disks. Wrap the disks in plastic or wax paper and transfer to a plastic freezer bag, squeezing out as much air as possible. You can store the dough in the freezer for up to three months. Let the dough warm up at room temperature until pliable. 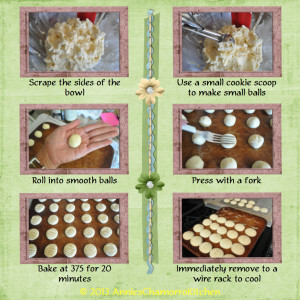 Break off pieces of dough, roll into balls, flatten with a fork and bake as directed. Hi! My name is jovie benavente from Guam I would like to say that the rosketti cookies here in Vancouver, Washington is the number one when I bake them I give sample’s so, that if they like it they will call me and order from me yes I sale my cookies it is olsome u would not belief it. so thank u for sharing. Hi Jovie. Are you selling the cookies made from my rosketti recipe? Gonna make for Christmas Day! Can the all-purpose flour be replaced with whole wheat flour? I would use half all-purpose flour and half white whole wheat flour instead of all (brown) whole wheat flour. Joy, I’m not sure exactly how many cookies this batch makes, but it makes quite a bit (several dozen) since they’re small. Wow! you are so talented thks for sharing! must try this one cuz I can never find the right ingredients for all except buy them at Tita’s Gojuria..love them with coffee. Thanks, Cuz! These are super simple to make. You’ll never have to buy them again. What size corn starch container is needed? You will need one 16-ounce container of cornstarch. Thank you so much. I cant wait to make them! !